International post tour itineraries are being offered to Buyers attending the 2013 AIME event, marking a first in the trade show's 21 year history. International post tour itineraries are being offered to Buyers attending the 2013 Asia-Pacific Meetings & Incentives Expo (AIME), marking a first in the trade show’s 21 year history. The new initiative from the leading meetings and events trade show in the Asia-Pacific region, offers Hosted Buyers the chance to take part in one of two new exciting post tour options to New Zealand and Singapore. With New Zealand only a short-haul flight from Melbourne, AIME, in conjunction with Auckland Convention Bureau (ACB), Air New Zealand and partners, will offer a post tour program to the vibrant and multi-cultural city of Auckland. The four-day post tour itinerary takes in a diverse mix of Auckland’s experiences, and is an ideal option for convention and incentive buyers from Australian, European and North American markets who want to sample the region’s sparkling harbours, native forests, outstanding cuisine and the tranquil islands of the Hauraki Gulf. Auckland Convention Bureau manager Anna Hayward says the post tour familiarisation trip is a great opportunity to show Buyers first-hand what makes Auckland a world-class events destination. “Auckland is full of surprises – it’s a dynamic city set in a natural paradise with a lifestyle rated among the World’s very best. We look forward to welcoming buyers from around the world to our harbour-side city,” she says. An exclusive four-day itinerary to take in the transformed cityscape of Singapore is also on offer to AIME Hosted Buyers who are interested in discovering first-hand the city’s cultural precincts, unexpected tracts of greenery throughout the island, the integrated resorts, and latest attractions such as the River Safari. The Singapore post-AIME tour is a great opportunity for meeting planners and buyers to experience first-hand the diverse experiences and venues that this cosmopolitan city-state can offer to delegates of varying interests and needs. “While Singapore is often acknowledged as a leading business city, it still surprises visitors with its ever-evolving landscape and new experiences,” comments Jeannie Lim, executive director for conventions & meetings at the Singapore Exhibition and Convention Bureau (SECB). “For meeting planners looking to create customized, impactful and enriching programmes, Singapore offers a unique proposition with its amazing array of flexible meeting venues, exciting attractions and entertainment options. Overlaid with a colourful tapestry of Asian cultures in a city that is compact, user-friendly and accessible, the overall seamless experience is one that only a few cities can offer,” Lim continued. The new international post tour program complements AIME’s already successful pre tour programs, which offer Hosted Buyers 15 exciting itineraries around Melbourne and the state of Victoria to choose from. Reed Travel Exhibitions (RTE) director for AIME, Sally de Swart, said that the show is committed to providing varied and beneficial programs for AIME’s international and domestic buyers and is excited to be able to add two new international post touring offerings in 2013. “Each year at AIME, we take on board the feedback of our attendees, evolving the show and keeping it fresh by bringing new initiatives to our exhibitors and buyers. We appreciate that many of our buyers travel to the show from overseas, and are excited to offer them an exciting international post touring program, endeavouring to provide unforgettable experiences,” Sally said. AIME takes place next year at the Melbourne Convention and Exhibition Centre on 26 and 27 February. 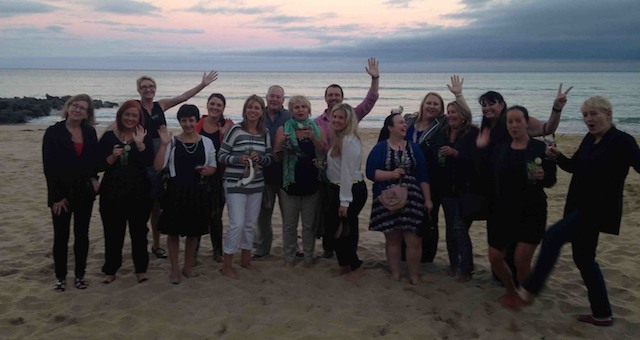 Ten event and meeting planners headed to Mantra Lorne after AIME this year.